Christopher Blosser of "The Ratzinger Fan Club" site and the "Against the Grain" blog has put together an exhaustive and excellent page of anti-Code articles, interviews, and resources. Definitely worth many visits! Disciple of the Code: "I consider my hardbound-copy a priceless possession." What's the big fuss about "The Da Vinci Code"? What are Christian leaders so afraid of? I have read that novel of Dan Brown and I consider my hardbound-copy a priceless possession. But my faith has not been swayed at all even after reading it for a second time. On the contrary, it confirmed my convictions about the matter, not that they were not already firm. The Catholic leaders, in raising arms against the showing and publication of "The Da Vinci Code," are actually doing what the book would like to portray the Church has done, that is, to hide facts about the Christian faith, for its own selfish ends. I find no blasphemous part in the story. There's nothing to hide. Whether it is offensive to the faithful or not, it is better to open it and for the readers to judge it. If one's faith is strong, no book or film can shake it. Well, Dan Brown has reportedly said that he's a "committed Christian." But he has also said in interviews and in his novel, through his protagonists, that humanity needs to return to an embrace of the "sacred feminine" and, apparently, goddess worship. He makes numerous false claims about Jesus, the followers of Jesus, Saint Mary Magdalene, and, of course, the Catholic Church. Is that blasphemy? Perhaps not. But it does add up to a lot of falsehood. Whether or not promoting falsehood about religious beliefs and history is bothersome or serious I'll leave up to readers. Meanwhile, another reader is kind enough to e-mail us and point out that Dan Brown's novel is fiction. Gasp. No! After reading the write up on your book, "The DaVinci Code Hoax", it seems to me like a whole lot of folks need a time out. I've read the Da Vinci code and, guess what? It's just what it purports to be - a work of fiction, nothing more! It does what fiction is supposed to do, it entertains, and does so quite well. Yep, "nothing more." Which is why it has a "FACT" page — to accentuate that it is just fiction and nothing more. Of course! How did I miss it? Oh, and for the (factual) record, my co-author, Sandra Miesel, doesn't like to be called "sir" or referred to as a "guy." This book has very little merit. Do some real research and stop the nonsense talk! The aggression against Dan Brown is a waist of time. A novelist can write anything he/she pleases. Criticize the religious scholars, the gnostics, and the historians... Not Dan Brown!! His facts came from his interests in those areas of study, not from him alone... Idiot! Ah yes, the Cult of the Untouchable Novelist. He is an Artist and therefore enthroned on high, above mere mortals and philistine scholars and historians. Of course, The Novelist has embarked upon study — but he remains safe from criticism because, well, Jose Gonzalez says so! 'Nuf said. It's a waist of time. And perhaps even a waste of time. Period. Is "The Da Vinci Code" the Perfect Post-Modern Novel? Tom Hanks is convinced his controversial new film The Da Vinci Code will aid forward-thinking vicars and help ministers swell their congregations. The actor suggests church leaders should use the film, based on Dan Brown's bestseller about the possible offspring of Jesus Christ, to start a debate that will encourage more people to attend church. Hanks tells Entertainment Weekly, "I think the movie may end up helping churches do their job. If they put up a sign saying, 'This Wednesday we're discussing the gospel,' 12 people show up. But if the sign says, 'This Wednesday we're discussing The Da Vinci Code,' 800 people show up." The novel and the upcoming film have been heavily criticized by Catholic Church officials, who believe the idea of Christ fathering a child and starting a bloodline that exists to this day is preposterous. They've urged their faithful followers to boycott Hanks' film when it is released next month. It reminds me a bit of John Lennon's infamous remark — "We're more popular than Jesus now" — although I suspect that Hank's comment was meant to be a more positive in nature. But at least this much seems clear: Hanks' job is to make a movie that misrepresents and (it is probably safe to say) disparages Christianity, while the Church's job is to clear up those misrepresentations. So, in his own strange way, Hanks is helping to keep pastors employed and bringing people in contact with the Truth. Who said that Hollywood stars don't have big hearts? In (somewhat) related news, ciphers and secret messages are being released that seek to make fun of the hairdo sported by Hanks for his latest role. People sure can be cruel, can't they? Sheez, stop picking on the guy's hair and make fun of his religion. After all, nobody likes a bigot. "It's the kind of fiction that provokes thought and conversation and debate..."
His goal, he says, was to duplicate the experience of reading the book, despite the fact that the book unfolds in real time over a day and the movie will run for about two and half hours. Certain things have been omitted, although nothing major has been changed. "We used the novel as the basis for our movie," says Howard, "and it is not a reinvention of the novel. It's a screen adaptation of The Da Vinci Code." "I think people relate to the story for personal reasons," says Howard. "Some are interested in the mystery, some are interested in the spirituality and some are interested in the locations. I honestly think that a lot of people get a lot of different things out of it." For more of Howard's thoughts on directing the movie, see this previous post. Sharan Newman is a medieval historian who lives somewhere in Oregon, where I also reside. She is the author of The Real History Behind The Da Vinci Code, which she wrote, her website explains, to meet "the needs of the curious non-partisan" by being "completely unbiased by religious opinion." Sounds to me like she has a bias against bias — especially Christian bias. As though all Christian books about The Da Vinci Code are filled with errors caused by "religious bias." Thank goodness for non-religious non-bias! Anyhow, a news piece about Newman reports that she hopes readers keep in mind that The Da Vinci Code is fiction. Not that she agrees with the book's premise that Jesus Christ had a child by Mary Magdalene and that his bloodline survives to this day. But knowing these claims are unsupported by historical evidence did not take away her enjoyment of the book. She hopes other readers will treat the novel's plot devices with a pinch of salt, too. 'When I first read it, I kept putting little notes in the margin, about...'this is definitely wrong'. But after a while, I got into just the story of the murder mystery...that I enjoyed,' said Ms Newman in a phone interview from her home in Oregon in the US. 'There are definite discrepancies. In terms of just geography, I wouldn't try to take the book and actually go anywhere in Paris because that's completely inaccurate,' said Ms Newman, who also writes mystery novels set in mediaeval France. She also found numerous factual errors in the novel - such as Godefroi de Bouillon being called the king of France when he was only a duke. The Da Vinci Code has sparked outcry from Christians around the world for its controversial claims. Describing herself as non-religious, she said: 'I really don't look at it from a religious point of view because religion is faith, and faith is what you have when there's no proof. Did I mention that Newman and her book are completely free of bias? Not that I'm unhappy that a medieval historian has taken the time to debunk some of the historical errors in The Da Vinci Code. But I should point out — in a very biased, faith-filled and therefore proof-less way — that The Da Vinci Hoax was co-authored by Sandra Miesel, a medieval historian. And that it has been endorsed by Catholics (Francis Cardinal George and Dr. James Hitchcock, for example), Episcopalians (Dr. Philip Jenkins), Evangelicals (Marvin Olasky and Dr. Darrell Bock), and even some atheists. And, yes, we do have a bias, as we've happily admitted before on this blog. Dan Brown: "Let the biblical scholars and historians battle it out..."
He's happy his best-selling novel about hidden religious history, secret societies and code-breaking has captured popular interest. The rest is not his responsibility. "Let the biblical scholars and historians battle it out," he said Sunday during a writers talk presented by New Hampshire Public Radio and The Music Hall of Portsmouth. "It's a book about big ideas, you can love them or you can hate them," Brown said. "But we're all talking about them, and that's really the point." In a talk before a friendly home-state crowd, part of a ''Writers on a New England Stage" series, Brown was a mixture of mild and feisty about the long-running controversy dogging his novel, which has spawned many other books attacking its speculative theme. The book posits a Catholic conspiracy to hide the survival of Jesus and his marriage to Mary Magdalene. ''My feeling is, these books are wonderful," Brown said, although he noted he had not read them. Their strong disagreement with him, he said, ''creates a dialogue which is vigorous and powerful. Religion has only one true enemy: apathy. The best antidote to apathy is passionate debate." He quoted a British priest, whom he did not name, as having said that ''Christianity has survived Galileo and Darwin; it can surely survive Dan Brown." The fundamental problem with "The Da Vinci Code" is that it subjects the traditional story of Jesus to unforgiving scrutiny, like an inquisitor who simply won't accept what his tortured victim is screaming at him. Then it proposes an elaborate thesis based on wide-eyed speculation, claiming that a few scraps of ancient writing--e.g., the so-called Gospel of Philip, a Gnostic text written in the third century--assert things that they barely even hint at. If this represents an assault on two millennia of Christian thought, as some have claimed, then the faithful can rest easy. They've survived Galileo and Darwin; they'll outlast Dan Brown. The audience learned that the former prep school English teacher hopes one day to return to the classroom, and that he rarely reads his work when it's done. "The Da Vinci Code" was an exception. As of this posting, no word what Brown's researcher thinks of the novel. Like millions of other readers, Carl Olson of Eugene raced through "The Da Vinci Code" shortly after the Dan Brown fiction thriller came out in 2003. But by the last page, Olson was far from enthralled. Instead, he was aghast - and determined to set the record straight. The result is "The Da Vinci Hoax," a 340-page, heavily footnoted book that seeks to debunk many of novelist Brown's assertions about Jesus, Mary Magdalene and the Catholic Church. Now, with the blockbuster movie version of "The Da Vinci Code" set to hit the screen next month, Olson finds himself jetting around the country, giving talks to mostly Catholic audiences about the novel's historical errors. He and "Hoax" co-author Sandra Miesel, meanwhile, are planning to update their own book, which has sold close to 100,000 copies. Olson, 37, knows what you're thinking: Why get so worked up about a novel that, by definition, is a work of fiction? His response: Many people who insist "it's only fiction" are all too willing to accept many of its tenets as fact. "I can't tell you how many people have come up to me, waving the novel in my face and saying, `I know the truth about your church and your faith. What do you say to this?' "
Among the book's central claims: Jesus and Mary Magdalene were married; they had children and a blood line that continues to today; the Catholic Church has used force and terror to keep this secret; and the great artist Leonardo da Vinci left clues about this secret in his art. Confusing matters, says Olson, are contradictory statements in Brown's book. A disclaimer says the book is strictly fiction. But the first page declares that the Priory of Sion and Opus Dei - respectively, a secret society and a devout Catholic sect that figure prominently in the story - are real, and that "all descriptions of artwork, architecture, documents and secret rituals in this novel are accurate." Olson is by no means the only believer hoping to use the book and movie as a tool for education. At the University of Oregon, for example, Campus Crusade for Christ adviser Mike Alverts and students in the interdenominational group plan to distribute brochures challenging the assertions found in "The Da Vinci Code." "I don't feel threatened by the book or the movie, but this is a good opportunity to talk about this kind of stuff because people have these questions," says Alverts. In an era when fact and fiction are increasingly blurred, a novel can leave "an assumption of validity," Alverts says. He especially worries, he says, "about the person who is interested in but doesn't have any real education about Christianity. They could connect dots that are not really there." 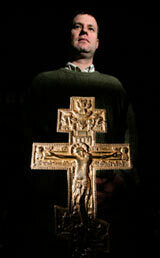 Nationally, the U.S. Conference of Catholic Bishops has created a Web site, www.jesusdecoded.com, that takes aim at many of Brown's claims. The conference has also created a documentary, slated for broadcast and DVD release on May 20 - the weekend of the movie's release. Bud Bunce, spokesman for the Archdiocese of Portland, said some local parishes have brought in speakers or held discussions on the topic, and bulletin inserts are being made available to parishes that want them. But the archdiocese's role has mainly been to direct people to the bishops' Web site - and to remind them that the novel and movie are fiction. "That's the most important thing to emphasize - it's not true," he says. Olson's book is one of several, and not the best-selling, seeking to debunk Brown's novel, which has sold more than 40 million hardcover copies worldwide. On his Web site, Brown hedges on the ancient theories discussed by his fictional characters, saying each reader "must explore these characters' viewpoints and come to his or her own interpretations." Brown also says on his Web site that he considers himself a Christian and that he wrote the novel "in an effort to explore certain aspects of Christian history that interest me." He points out that since the beginning of recorded time, history has been written by the "winners" - those societies and belief systems that conquered and survived - and should be viewed in that light. Olson says many have urged him to simply ignore Brown's book and the upcoming movie, reckoning that his protests are merely fanning their popularity. But Olson - the editor of an online magazine affiliated with Ignatius Press, a Catholic publishing house - says it's almost as if he's had no choice. "I think it can't be ignored from the obvious fact that people are asking these questions," he says. "I've given dozens of talks and not solicited one of them. People are contacting me." The irony for Olson is that he grew up in western Montana in a fundamentalist Protestant faith that was, he says, anti-Catholic. "We were nice to our Catholic neighbors, but we knew they were all going to hell," he recalls. After years of soul-searching and study, including a master's degree in theological studies from the University of Dallas, Olson converted to Catholicism. He and his wife - they met at Multnomah Bible College in Portland - are the first Catholics in their respective families. They and their two children attend Nativity of the Mother of God Ukrainian Catholic Church in Springfield. An aspiring academician, Olson previously wrote a book called "Will Catholics Be `Left Behind'?" - a reference to the popular series of novels anticipating the Rapture, when Christians will be removed from Earth before a time of tribulation and the Second Coming of Jesus. Olson's answer is no, because Catholics generally don't believe biblical interpretations that foretell a Rapture. His "Hoax" book, meanwhile, has landed him on radio and TV talk shows around the country and beyond - including CNBC's "Capital Report" and BBC Radio in Ireland. Olson sees several reasons for the enormous popularity of "The Da Vinci Code," including the timing of its release, which coincided with the emerging sexual abuse scandal of Catholic clergy. Also, many people have a deep dislike or distrust of religious authority, "and the Catholic Church and papacy are kind of the epitome of that." But Olson contends that anti-Catholicism - what he calls "the last accepted prejudice" - is also at play. "Does anyone really think if Dan Brown wrote a novel that basically attacked and rewrote the history of Islam or Judaism or Buddhism, that people would go for it?" he asks. "You don't have to be conspiratorial to say that a dislike of the Catholic Church can be found in certain parts of the media and entertainment industry." Olson says "The Da Vinci Code" is hardly the first time a novel has had a profound impact on popular culture - pointing to such historic examples as Harriet Beecher Stowe's "Uncle Tom's Cabin" and Upton Sinclair's "The Jungle." But these days, he says, people who would never pick up a scholarly work on the origins of Christianity will eagerly read popular fiction, and embrace it as gospel truth. "Those lines are increasingly blurred in the age of reality shows," he says. "If Jesus didn't exist or was not who Christians think he was, then Christianity is a complete sham," he says. "It's really an all-or-nothing proposition. The Washington Post: TDVC is "the literary equivalent of being offered champagne with your chocolate truffles"
The astonishing success of "The Da Vinci Code" -- 40 million hardback copies sold in three years -- came about because Brown, by accident or design, hit upon a brilliant two-part formula. His basic message was a scathing attack on Catholicism for 20 centuries of alleged sexism, violence, hypocrisy, corruption and related sins. Of course, all that has been said many times before, although mostly in nonfiction. Brown's inspiration was to present his case through the most popular form of fiction we have, the modern thriller, which enabled him to use murder, mystery, suspense, romance, chases and related devices to hook the reader. If you were open to his basic message, as millions of people obviously were, his delivery system made the combination irresistible. It was the literary equivalent of being offered champagne with your chocolate truffles. 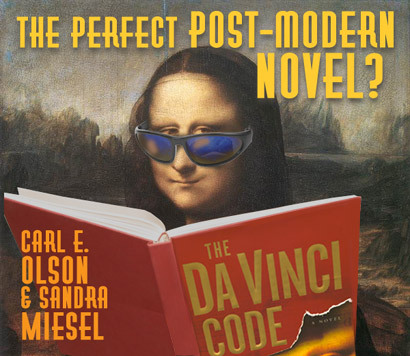 When Sandra Miesel and I wrote The Da Vinci Hoax, we expected to be criticized by fans of The Da Vinci Code (TDVC). And we expected that some of that criticism would be uncharitable and illogical. We haven't, so to speak, been disappointed. But when a fellow Catholic and critic of TDVC recently wrote a column titled "Does Ignatius Press promote Gnosticism?" and made a number of dubious and incorrect statements about The Da Vinci Hoax, I was both surprised and disappointed.